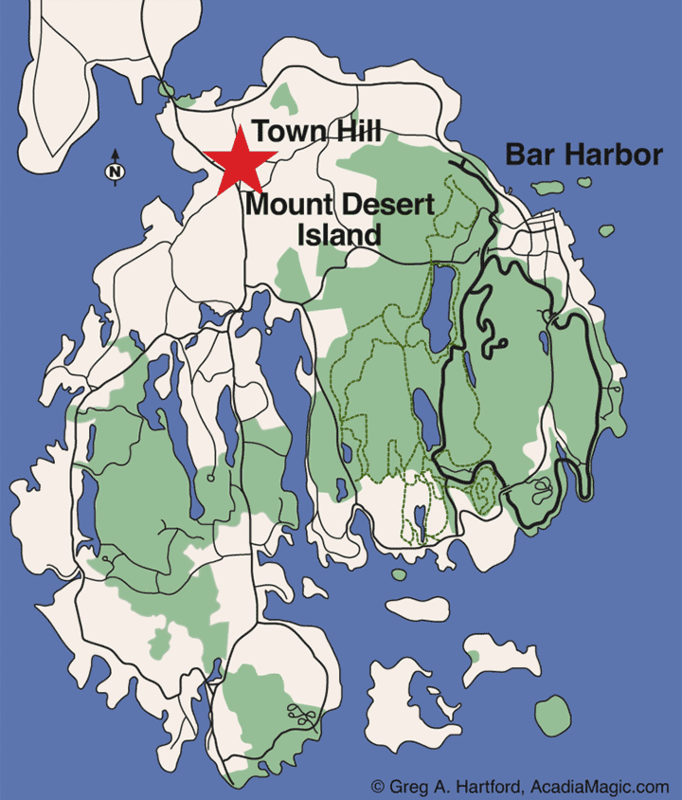 Town Hill is a small village within the municipality of Bar Harbor, Maine in Hancock County on Mount Desert Island (MDI). It sits at the intersection of several roads, each of which leads to a place of note. If you refer to a map, you will see the village at the top center of MDI. 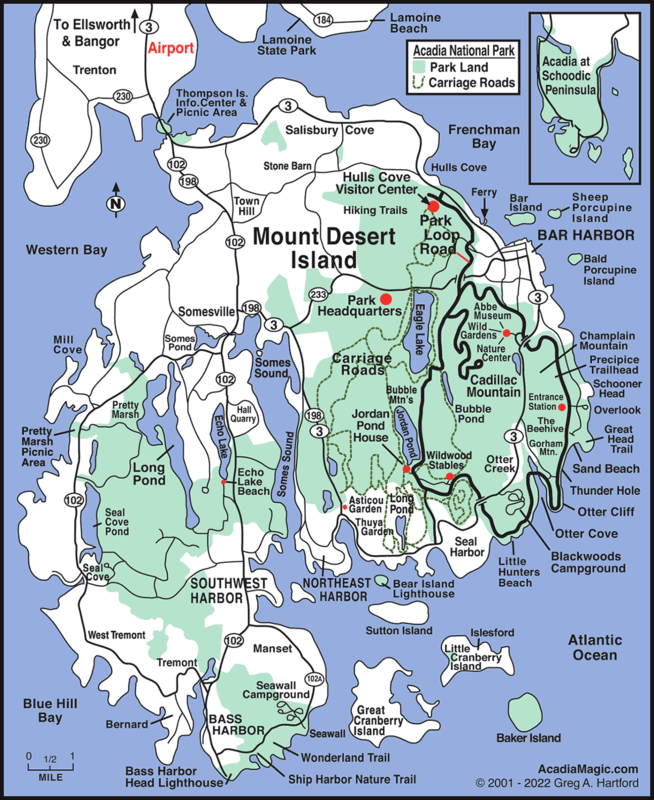 Route 3 is the only road that connects MDI to the mainland. Just as Route 3 enters the island, it takes a sharp left turn on the way to the Bar Harbor center. Before this, Routes 198 and 102 continues straight South for about 2 miles until arriving in Town Hill. The main place you will notice is the Town Hill Market on the left where you can get a variety of goods including sandwiches, drinks, etc. Certain days of the week fresh loves of really good bread is delivered and on sale here. On the opposite side of the store is the Knox Road. This heads back in the opposite direction and connects back up with Route 3 to the North. Taking a right goes to Bar Harbor. Take a left and it goes back to where you first got onto Mount Desert Island. Just before arriving at the Town Hill Market, on the right is the Indian Point Road. This goes to the western side of the island and eventually arrives at Pretty Marsh near the Pretty Marsh Picnic Area in Acadia National Park. Immediately after the Town Hill Market to the left is Crooked Road. This winding road goes East and eventually will connect up again with Route 3 but this time it will be at Hulls Cove, another village in Bar Harbor. However, there is a very interesting and beautiful historic stone barn about halfway on the left called the Stone Barn Farm which you will likely want to photograph. It has gorgeous workmanship. If you continue going straight on Routes 198 and 102 as you pass through Town Hill, within about 2 miles you will arrive in Somesville, a place of historical significance for the island. Route 198 takes a left, connecting up with Route 3, and goes to Northeast Harbor. Route 102 goes further south to Southwest Harbor. It also loops around to the West towards Pretty Marsh Picnic Area, then continues onto Tremont, Bass Harbor and comes back to connect up in Southwest Harbor again. Town Hill is one of those unique places that sit at a crossroads to a lot of different and interesting places. There is a very small, almost tiny, food place called Mother’s Kitchen that is on the left or eastern side of Routes 198 and 102 before reaching Town Hill from the North. It is a short distance after Ellsworth Building Supply (EBS) on the same side of the road. My experience has always been a good one here and the food quality and taste is very good. There are some small sit-down spots but mostly it is for carry-out. If you appreciate good food, especially to organic and garden grown type, check this place out. Let them know that AcadiaMagic.com let you know about them.